By Anjali Fluker – Associate Managing Editor, Orlando Business Journal. Cherrylake Farm’s company culture is in action everywhere on its property. The fully integrated landscape company and 1,000-acre farm in Groveland, a subsidiary of diversified agribusiness IMG Enterprises Inc., engages with partners to build a sustainable future. And it describes its culture as an actionable set of values, attitudes and rituals that grow and develop organically, guided by its leaders’ intentional focus. Cherrylake boasts a diverse workforce of more than 300 people and jobs, all guided with purpose and passion for the bigger picture that includes taking care of its employees, the community and making an impact with “landscapes that will outlive us,” said Chloe Gentry, director of marketing and organizational development. Cherrylake encourages its employees to grow personally, as well as professionally, by offering training and leadership seminars, personal coaching and wellness programs like walking meetings and running trails. Those in the office also have their choice of workstations, whether that’s stand-up desks, running meetings or working from a pickup truck — whatever works for them. It also installed specialized sundecks on one of the lake’s shorelines, making the most of the company’s scenic campus and creating a home for its new yoga program for employees and their spouses. But there’s also a pretty extensive process before a person joins the team. The company developed a successful referral bonus program and distributed more than 20 of those bonuses in the last 10 months. These referrals help ensure individuals being recruited understand the scope of work and identify with the purpose and values that Cherrylake represents. The company also brings in a group of Cherrylakers to do “culture interviews” during the recruiting process, to see if the candidate’s values align with the company’s. “These culture interviews are designed to be an opportunity for both the company and the potential recruit to identify if they feel they could enjoy themselves and thrive within our culture,” Gentry said. The family-owned company offers a family-friendly work environment, giving employees flexibility to integrate family and work priorities — and it considers everyone part of the Cherrylake family. The firm also provides its workers community volunteer opportunities, including the Ag in the Classroom agricultural education programs in local elementary schools, Give Kids the World, and Christmas food and toy drives. What specific programs has your company implemented to benefit employees? Wellness Fridays, which have included martial arts training, meditation, coffee and tea tastings, and more; personal coaching with an outside consultant for employees, including leadership training in both English and Spanish; creating spaces on our farm, like our “wellness room,” which transformed unused office space into a calm retreat outfitted for a centering yoga flow, a mindful moment of meditation or a heart pumping workout; flex time, using a combination of tech (Chromebooks and campus-wide Wi-Fi access) and culture to empower employees to develop their own most effective schedules. Funniest or most interesting piece of office décor: Our floor-to-ceiling “Appreciation Wall.” Half is a white board and the other half is a cork board. We have magnets, letters and fun sayings on the wall, and employees can post photos, write words of encouragement, share letters of recommendation, give high fives, etc. It starts fresh every week and is run by employees. You never know where they will take it from one week to the next. Your office’s top hangout spot: Our new wooden meditation decks that take advantage of the unique panorama of natural landscapes and stunning views of our acres of trees. These decks transform seamlessly from peaceful meditation to outdoor meetings or picnic lunches. The best part is that they’re portable. One day they’ll be in front of one of our lakes, another day, underneath an old oak tree hammock. How do you measure ROI on rewards, recognition and other perks? We survey all employees bi-annually through our Employee Net Promoter Score and customers through a Customer Net Promoter Score. We believe these indicators are symbiotic because happy employees make for happy customers. Tenure and turnover rates also are tracked and celebrated via the firm’s Employee TV portal system and at events such as the Annual Service Awards Breakfast. Another strong indicator for us is the number of promotions offered to employees, which sheds light on our continuous learning and career growth programs and emphasizes our culture of promoting from within. But the greatest impact comes from the informal daily appreciation the culture enables. How do you boost employee retention at your company? Once a team member joins the Cherrylake family, we work on developing employees to help them achieve their potential. By giving employees the freedom to take risks, make decisions and contribute in their own unique way to the company’s purpose, we recognize their intrinsic value and creativity as human beings. This creates an exciting and fulfilling work environment where employees can grow professionally and personally. Are you hiring now? We expect to hire about 30 more Cherrylakers by the end of 2018. Your most anticipated team-building activity: Our annual Family Fiesta held each spring. From fishing and soccer tournaments to drum circles and bounce houses, this annual employee appreciation event is a great opportunity for team-building and getting to know others as one big Cherrylake family. Advice for a company looking to create a better workplace: Be authentic and let the changes come from within the organization. Encourage people to be their whole selves and to bring not only their professional, but also their personal, passions with them to work. 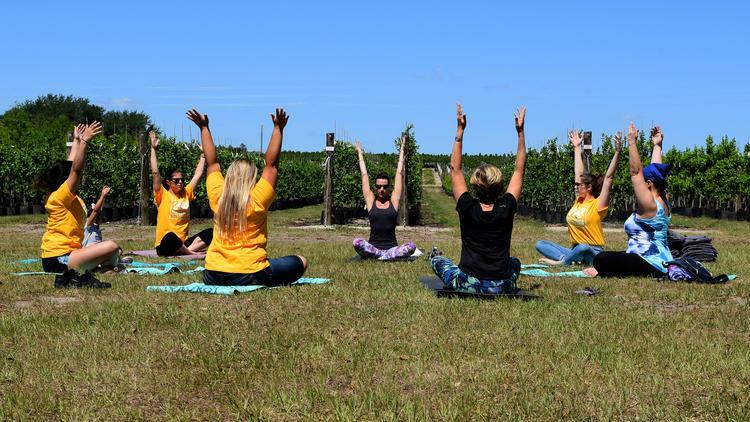 Cherrylake staff members gather for a yoga class at the Groveland-based company’s tree farm.